Home » Staff » Fr. Joseph F. Wagner, S.J. Fr. Joe Wagner, SJ, was born and raised in Erie, Pennsylvania, an only child and a spoiled only grandchild. He graduated with a degree in Mathematics from MIT. Following a Master’s in Mathematics at the University of Wisconsin—Madison, he entered the Society of Jesus in 1988. 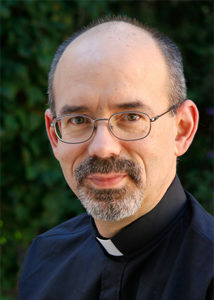 Always a bit slow, he needed more schooling, so he completed his theology studies at the Jesuit School of Theology Berkeley, and remained in the Bay Area to complete a Ph.D. in Mathematics Education at the University of California, Berkeley. In the middle of those years, he was ordained a priest in 1998. After thirteen years on the Mathematics faculty at Xavier University, Cincinnati, OH, he decided he had his fill of academia and wanted pastoral ministry to be a bigger part of his life. In 2016 he arrived at St. Mary Student Parish where he has happily found a new home.